The studio is a big chaos – colors, paintings, tools, computer, woods and others materials. It’s a space that someone is working and it is an evidence for an active artist. 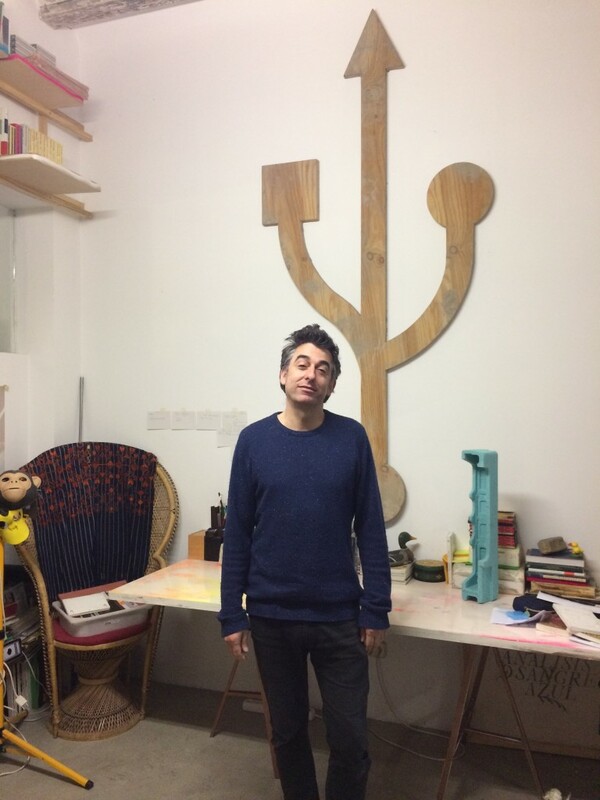 He was just working on a large project for ARCO, the national Spanish Art fair, which will open at the end of February. It is our third meeting and every time he succeeds surprising me with the way he thinks and what’s motivating him. Enrique works with HTML programming, installations and drawing techniques to explore the border between the digital and the analog worlds – he kind of chose to live in the limbo, what makes it so interesting. By doing so, he creates an ever-increasing field that allows him to comment on the technological progress as a reflection of the social and financial evolution, and therefore the relationships between temporality and technology. We sit for a conversation to learn more about him, his philosophy and art. TheArtian: Enrique, you investigate and explore the border between the digital and the analogue worlds – why you chose to be in that space? Enrique Radigales: It was kind of a revelation: when I finished my painting studies (1995), I wanted to expand my artistic training and started two courses: one of engraving techniques at the Escola Massana (Barcelona) and then a post-graduate course at the Polytechnic University of Catalonia about Authorware, a graphical programming language. In the morning I was studying a new language at the University and in the evening I was drawing with a stylus on a copper plate. These were two differed experiences in time and in forms: in the morning I was composing sounds and images on the screen (I had never touched a computer before) and in the evening I was scratching a sheet of metal. One afternoon it occurred to me that I made a mistake with the keyboard’s key, scratching a space that should have been blank, and unconsciously pressing the ​​a ⌘Z aiming to fix the mistake. TA: You live between the world of artists and programmers…how you define yourself, a painter or a digital artist? TA: You explore the progress in technology and some of your projects, like idealword, are programmed and based on technologies from the 90’s. In that sense you are kind of a live museum for technologies. TA: What is actually Idealword project? ER: During 2003-2008 the project idealword, which belongs to Net.art, functioned as a kind of an illustrated diary, where I reflected on the uses of technology and its influence over the way we interact, work and use our leisure time. But I was mostly interested in exploring the border between the new virtual world and the old physical world. A blurry border, a no-place that could give us the keys to understand our relationship with the machines. When I started the project in Glasgow, I was still connected with a 28000 baud modem and even the web content was designed for a screen with a resolution of 800×600. Formally, I wanted to technically transcend these limitations, so I developed a technique of digital drawing (MouseStrokes) that allowed me to draw on the screen images without collapsing the width of the sides. I also used the source code as another graphic element, which allowed me to expand the meaning of the content. Another feature of idealword.org was that the entire content on the display could be printed for free as a DIN-A formats. At that time I was heavily influenced by the flow of the free movement of knowledge, such as the Copyleft, and later by Creative Commons licenses. That allowed idealword.org drawings to be published on digital platforms as well as in print publications. TA: A part of your work reminds me ideas that I heard from Douglas Rushkoff – that we use technology without understanding it – that many of us are digitally literacy. What do you think about that? ER: I think that in just a few years we have been forcibly “educated” by the technology industry, which does not mean that we are digitally literate. We have suffered a digital transformation, passing from the ergonomic mouse and graphical interfaces to managing our lives through multiple touch screens. I think that one of the errors about digital literacy is to think that free internet access around the world is a moral obligation. Digital literacy brings extraordinary knowledge – there is no doubt about it – but it also creates an economic virus that mainly favors the more developed countries. Projects such as the social network Free Basics, which give free coverage to some internet content in the process of “developing” countries, remind me of the first evangelical explorers, who, using the excuse of bringing civilization to indigenous peoples, ended up transforming their culture, knowledge, environment and the way of a cyclical, balanced and sustainable living. Because technology tends to develop by its own principles and laws, which, paradoxically, have a very different growth patterns of the way human beings grow. TA: You research the progress in technology and your project “12 meters of landscape” is a part of it. What did you discover through this project? ER: In this project I wanted to talk about the internet’s neutrality, walk over a landscape of a content which is free and accessible to all internet users. 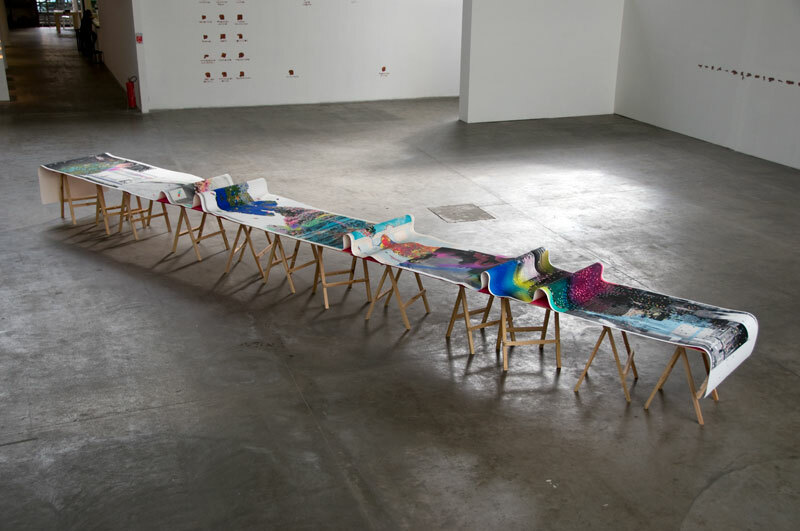 The project consists of two parts, a physical one – a print of twelve meters, and another in HTML format with images from the internet related to the word “landscape”. In the physical version I looked for images that relate to the word “landscape” and after I combined the images in a 12 meter document which was printed in one-time on Hahnemühle paper 310 g (that by itself was an adventure…). After the printing I intervened with acrylic paint. The device was formalized following topography of mountains, valleys and plateaus, using various media such as wood, string and cardboard tubes. TA: You mentioned that the art world sees you as geek and the technology world sees you as not fundamental in your programming. You live in the limbo… What are the benefits as to be misfit? Enrique Radigales will talk and present his projects on TheArtian Community event in Google Campus Madrid on February 16, 2016 19:15. You can register to this event in the following link. Thank You Inna Barak and Marián Paynter for assisting us with the translation.